We left our base camp to start our hike this morning. 3 hour rider to the trailhead and then walk up up up. I finished hiking for today. You can check out my current location on the map and I'll post about my day when I am in coverage. Over the next week, I'll be posting about my Trip to Africa to climb Mt. 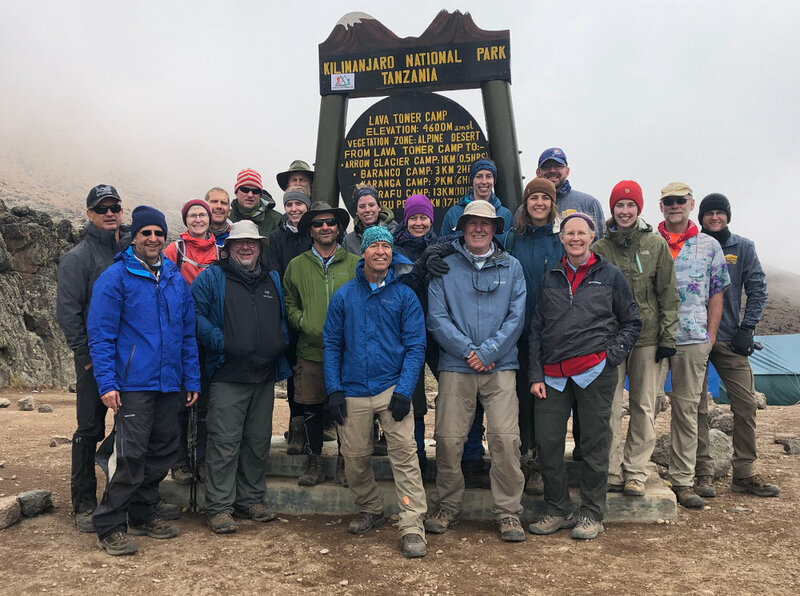 Kilimanjaro over 8 days and then experience the Tanzania for a week. My wife accompanied me, along with 20 other people, to climb the mountain so it was quite an operation! Travel to your destination is often the most expensive part of an adventure. The flight to Tanzania from Minnesota cost a lot of money and time. 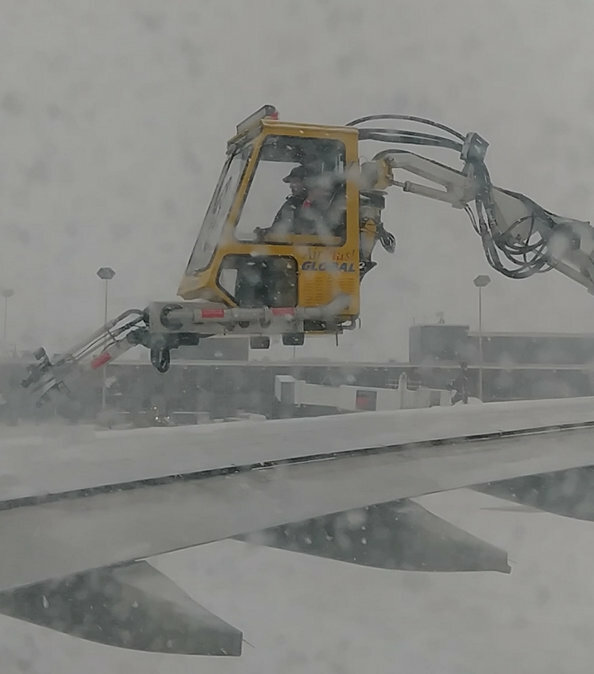 Our adventure started in the midst of a snowstorm, requiring de-icing of the plane. That was immediately followed by an engine problem resulting in a delay, followed by another round of de-icing. 3.5 hours after departure time, we finally pulled away from the gate. Once we were airborne, it wasn't too bad. Long flights are something of a time warp - an entire day is used up sitting, watching movies, and eating plastic food. 12 hours later, we arrived in the Netherlands. 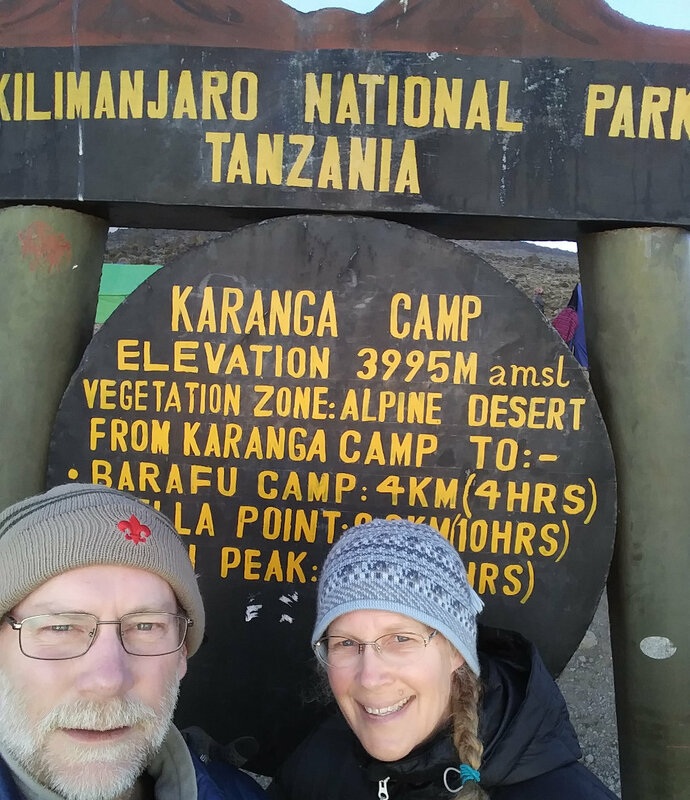 After a quick sprint through the Amsterdam airport, another 8 hour flight got us to Kilimanjaro airport, 9 timezones in the future. 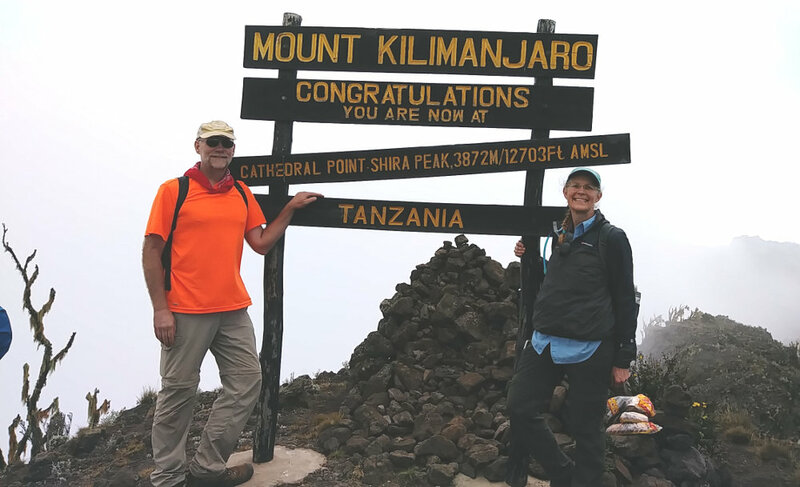 The owner of our safari company and our lead climbing guide met us after fighting and clawing our way through the tangled mess of Tanzania immigration. Get your visa BEFORE your trip to avoid a LONG wait on arrival. Just like at Disney World, go as far to the left as you can in this mass of humanity that just arrived to press ahead as much as possible. Reaching our first night's camp around 11pm, via a long, bumpy bus ride, we all just claimed tents and crashed until morning. It was nice being out in fresh, cool air with no bugs and unfamiliar stars across the sky. With the morning light, we could see that we really were in Africa - banana, acacia, and mango trees, intense sun, and a far-off glimpse of Kili. Expecting these things made it easier to deal with them. The company we're using is Tanzania Choice Safaris - a Tanzania-owned family company. 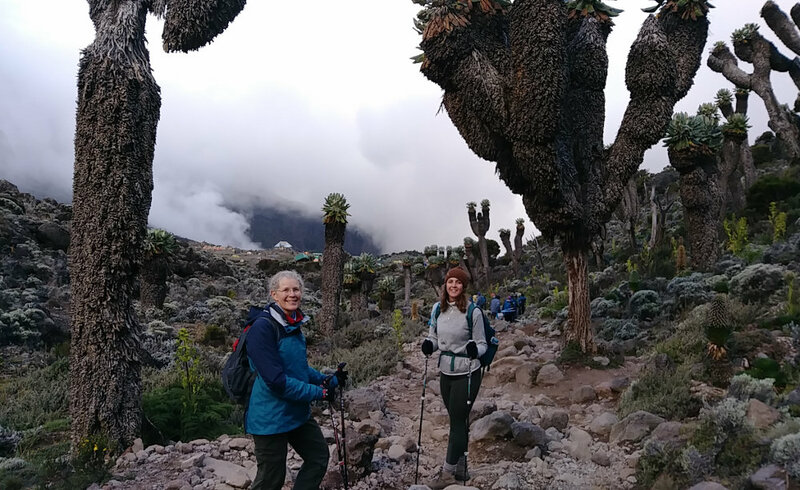 Kakasii and Brenda Kimaro run the company and employ many local guides, cooks, and porters to handle a successful Kilimanjaro trek. On Facebook at TCS. 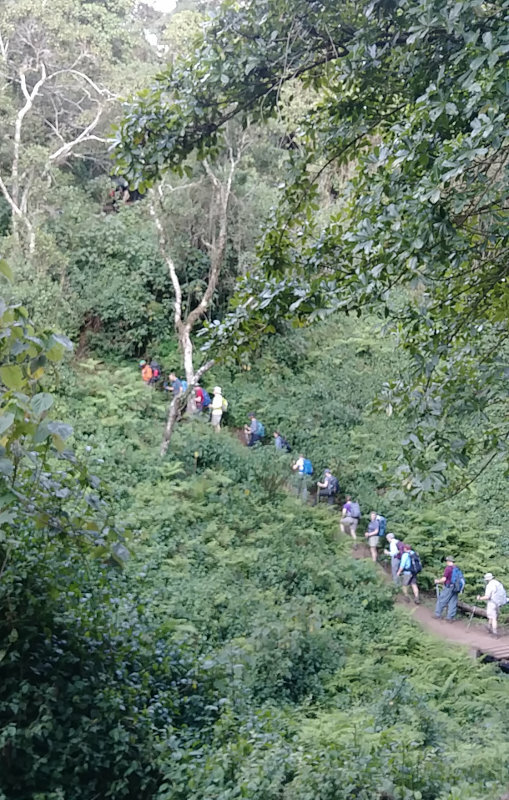 It quickly became clear that TCS was a good choice and they did a wonderful job throughout the entire trek. Now that we're settled in and two sets of lost luggage finally made it from Amsterdam, we'll start the actual hiking tomorrow. It seems to be taking FOREVER to start hiking! From our base in Uswaa village, all our gear was loaded on two buses for the long ride to the trailhead. Mind you, we did no work - the tents were taken down, packed, and loaded by our guide team. All we had to do was get our little day packs ready and sit on a bus. And, this was all after a huge breakfast cooked, served, and cleaned up by others! Our ride up the mountain was often like a rickety, wooden roller coaster ride, and our bus even had a mechanical problem. Just a leaking radiator hose, but enough to be interesting. 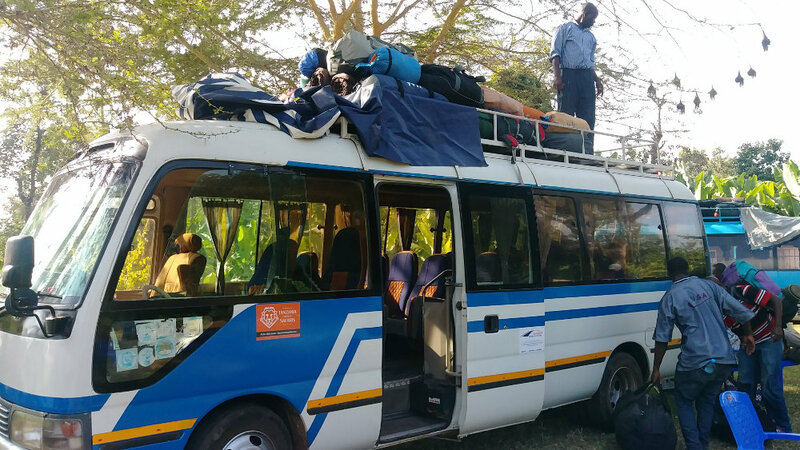 We leisurely climbed in our air-conditioned bus from the dry African plains through fertile forest land where hundreds of workers harvested carrots and potatoes all day in the heat. I should say that 'heat' is relative - many of them wore stocking hats and sweaters. 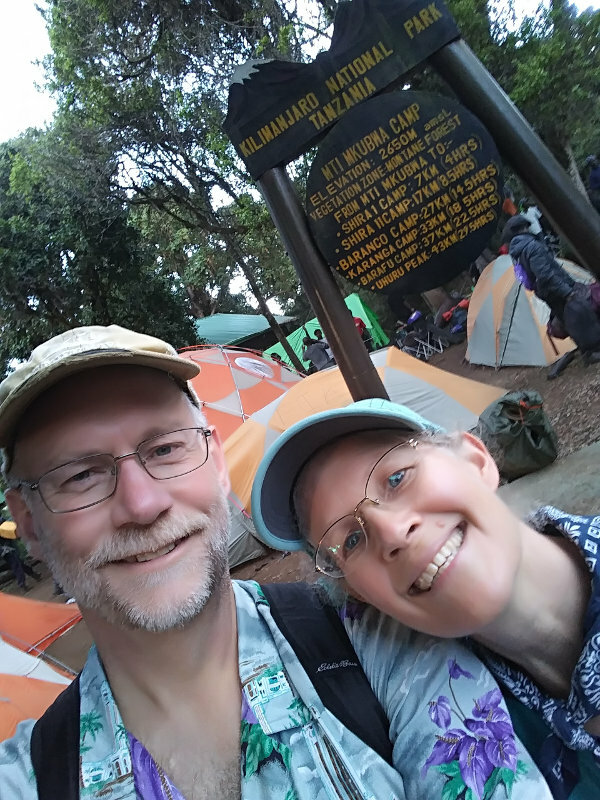 We eventually reached the Londorossi Gate to the Kilimanjaro National Park where we registered and our tour operator paid all the fees. And, the hiking and camping fees are big! It cost around $140/day for each person in our party. I don't know what that revenue is used for, but I saw no sign of trail maintenance on our trek. 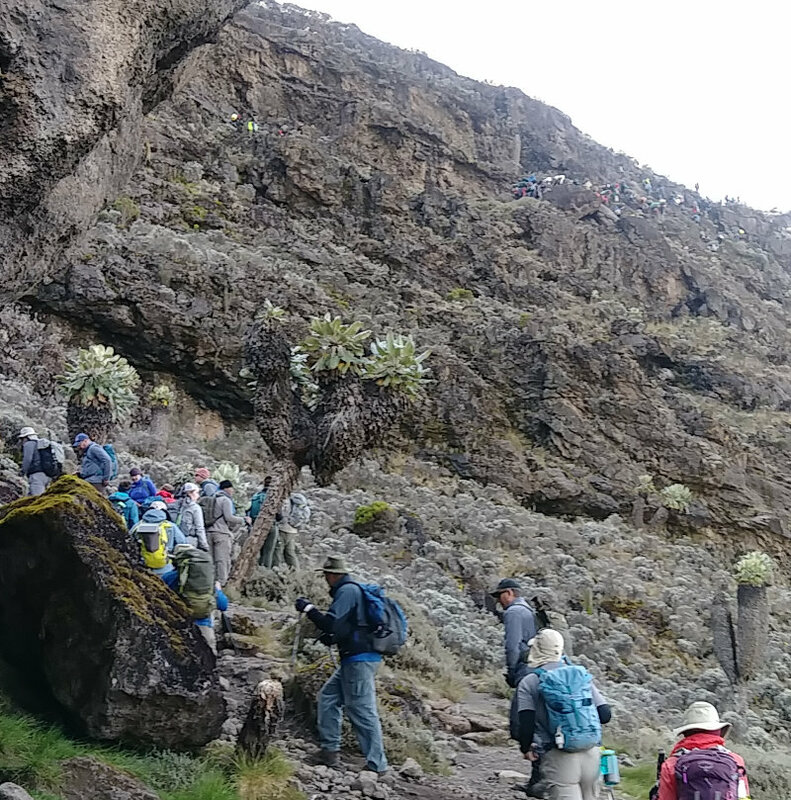 After a very nice lunch, and watching all the porters get their loads officially weighed, we piled back in the buses for the last leg to our trailhead. 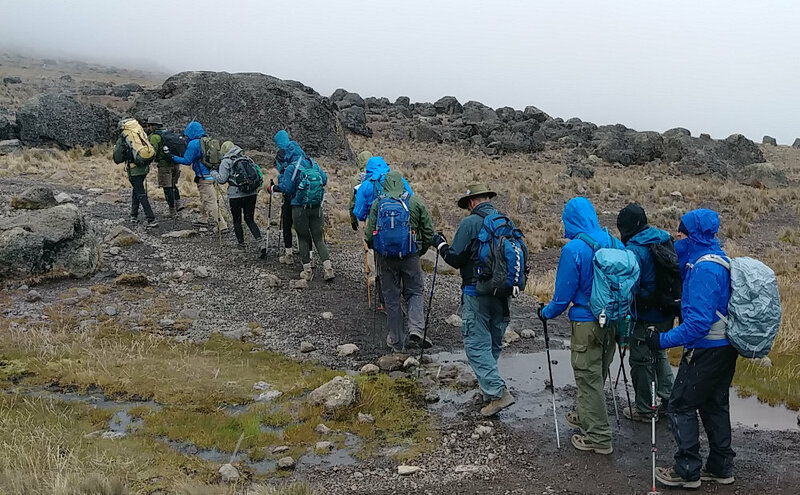 Besides the 22 people in our big group, we are being supported by a lead guide, assistant guides, cooks, and porters. All this is a total of around 90 support people - or 110 people all together. It's an invasion! Yes, we're finally hiking! Scrambling out of the bus, trying to avoid the porters throwing packs off the top, we all tumbled in a mass to the trailhead while adjusting hiking poles, fidgeting with pack straps, and smearing on sunscreen and/or bug repellent, depending on personal concerns. I saw no mosquitoes the entire trip, and this first day was all through rain forest so no sunscreen either. Have you ever seen a freight train start moving? The engine pulls, the couplings clank together, and the whole thing slowly lurches along, slowly gaining speed. Our group was similar, except we never got to the 'gaining speed' part. The day was a very casual hike on a very worn path through a beautiful forest of exotic trees. It's just as well since it was still quite warm and humid this low. We did gain 1400 feet over 5 miles, but it came from only a very few short, steep climbs. Monkeys occasionally appeared in the trees, but they were the only wildlife - what would you expect with hundreds of people walking past? Ours was not the only group using this trail. 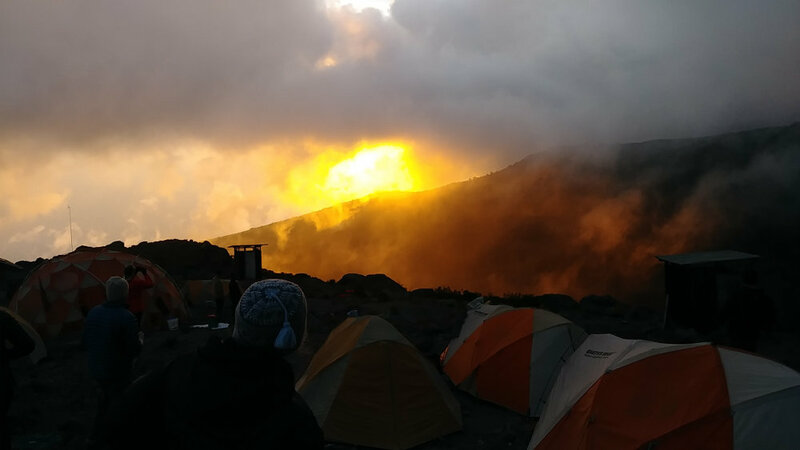 We arrived at Mki Mkubwa camp at 9200 feet as the day wore down. This was a very busy camp and our tents were packed together. I found the tent my wife and I would share for this trek already set up on a nice, flat spot. This would be the norm through the week, our support crew doing an excellent job of racing ahead to the next campsite early to hold the best spots. 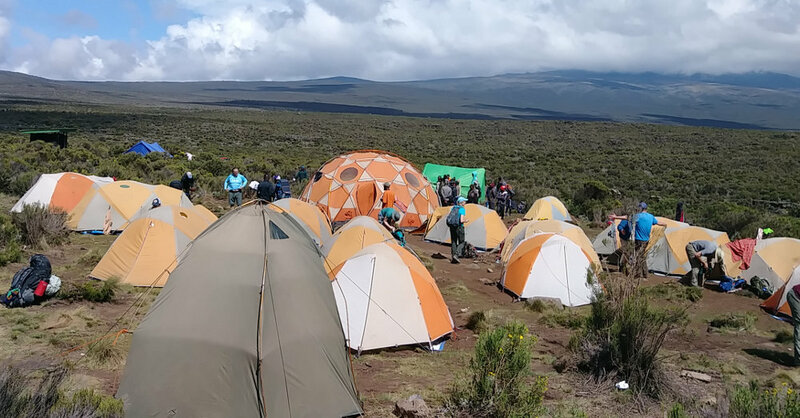 Soon after we arrived, we were each given a bowl of hot water to wash with, then gathered in the large dome tent which would be our meal tent for the next week. I dubbed it the Thunder Dome, but it didn't really catch on. The dinner routine developed quickly - coffee, tea, or cocoa at your leisure, followed by soup, then the main meal. All this prepared in the kitchen tent and served with flourish in the Thunder Dome. Folding chairs, tables with table cloths, real plates, cups, and utensils were all carried from camp to camp for us! After dinner, our lead guide laid out the next day's plan to finish off this day. Brush teeth, use the carried in portable toilet, put in ear plugs, and off to bed. Bed was a very cozy sleeping bag on a soft mat, both rented from the outfitter for a few dollars, along with hiking poles, so we didn't have to transport them on the plane. This night, as would happen every night, I slept very well and hardly remembered having my head hit my rolled up down jacket pillow. We hiked from 7800ft up to 9200ft over a distance of about 4 miles, all of it through rain forest. As it turns out, our group is very good at 'Pole Pole'. We have a guide leading the way and we are not supposed to get ahead of him - no one has yet. His job is to make sure we don't hike too fast. 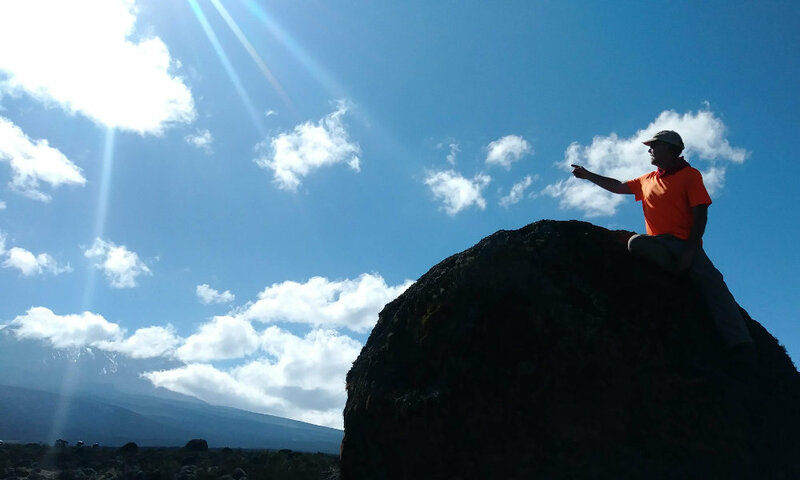 'Pole Pole' is Swahili for 'Slowly' and that's how we're supposed to hike. This is by far the slowest hiking I have ever done. We aren't even at any elevation yet and we're going less than 1MPH. Oh yes, I would prefer to go faster but I was expecting a slow trek, so I'm fine with strolling along and enjoying the scenery. And, the scenery really changed today! 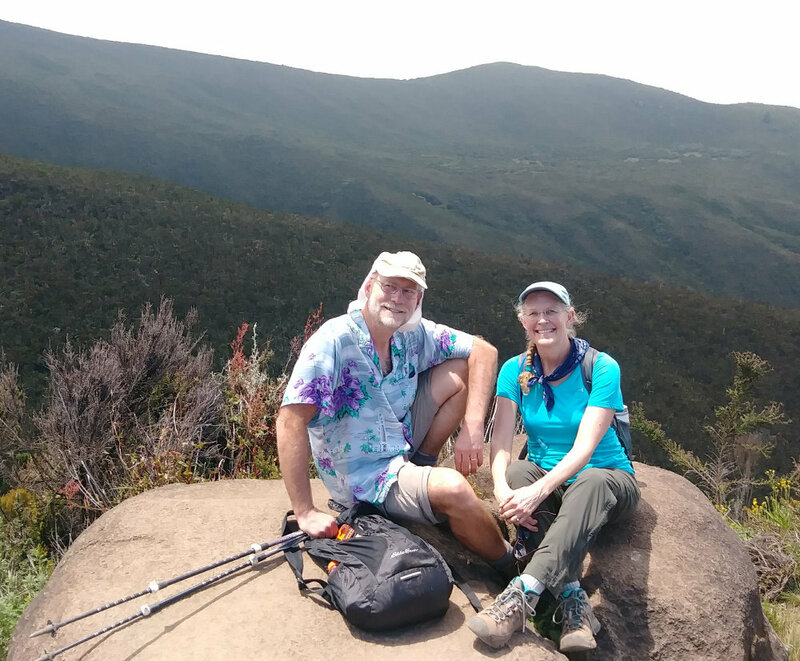 We climbed up the Shira Ridge out of the jungle into tall scrub bushes and open sun. As the brush became smaller and our elevation became higher, we had great vistas out to the north and west where we could see the forest we had just left behind. All the big trees stopped growing at a certain elevation. You could see an obvious contour line where the trees stopped all along the hillside - very cool. And, we got our first glimpses up the high slopes of Kilimanjaro. Besides summit day, this was the hardest hike of the trek because it was warm and humid and a good gain of elevation. It was only a couple miles, though. Reaching the upper end of the Shira Ridge, we traversed the Shira Plateau - a vast, relatively flat, plain reaching to the flanks of Mt. 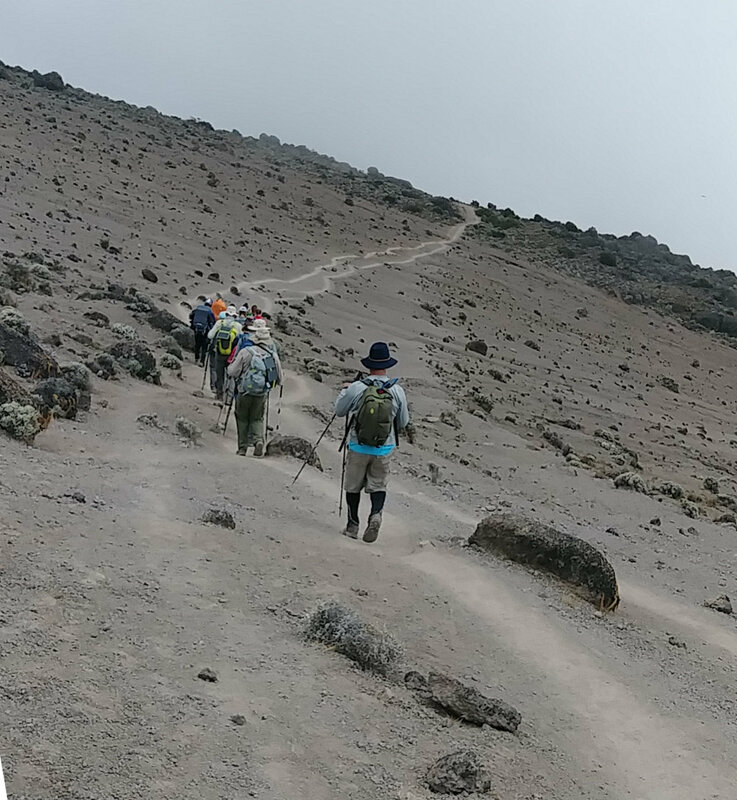 Kilimanjaro - to our campsite. 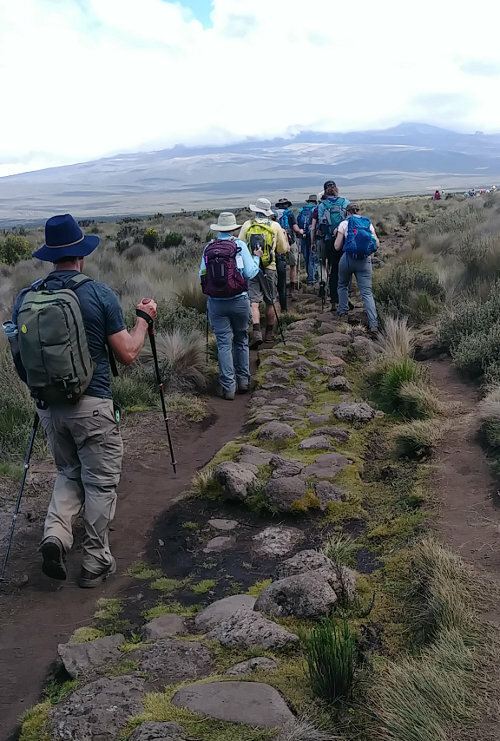 So far, we've not actually been hiking on what most people think of as Kilimanjaro. 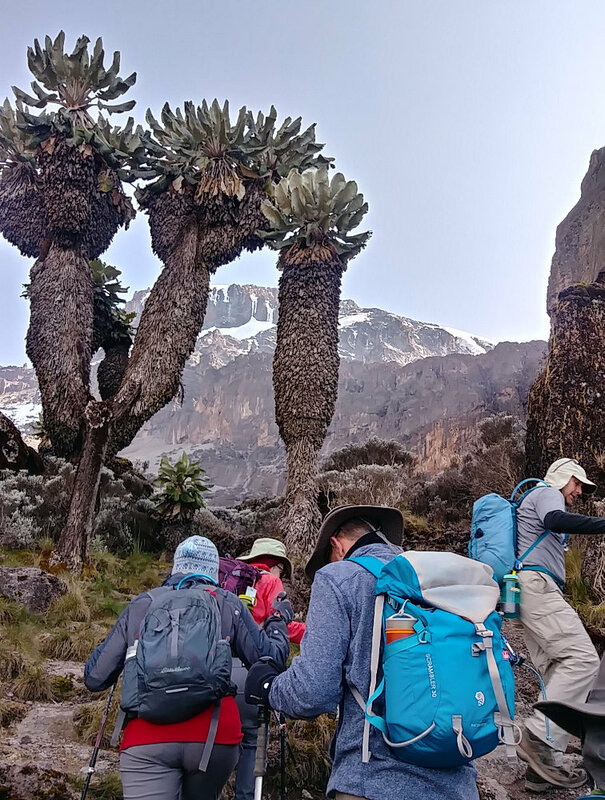 The mountain has three volcanic cones: Kibo, the highest in the center at 19300 feet; Mawenzi, to the east at 17000 feet; and Shira to the west at only 13000 feet. 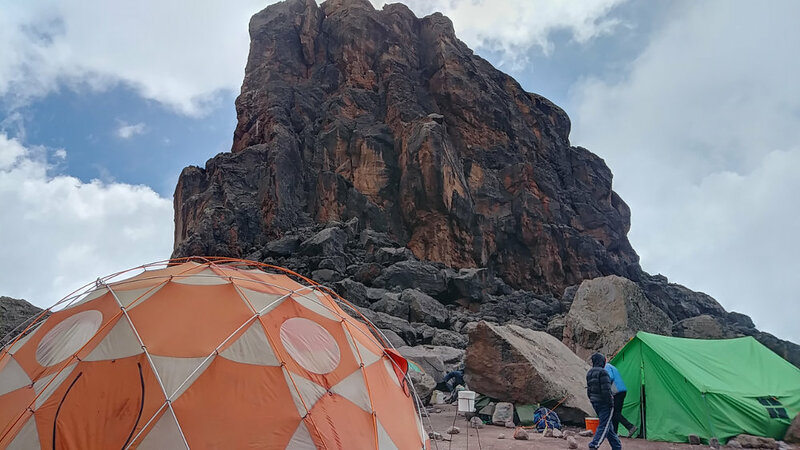 Uhuru Peak is the top of Kibo and that is our destination but we've been walking up and along Shira the first 2 days. 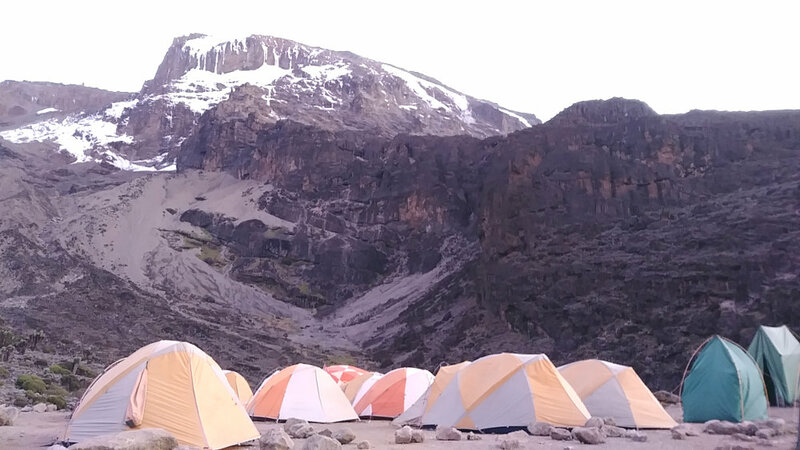 Tomorrow, we'll reach Kibo's slopes. Across the plateau, as is true for the entire trek, the trail was obvious. Thousands of people a year tend to make a well-trodden path! But, for a half mile or so, the trail was constructed of large rocks arranged in a 3-foot wide path across the wilds. Some crew of workers put in a lot of time building it, but no one uses it. You can see in the photo that there are two well-worn dirt paths on either side but moss in the middle with the rocks. So, I guess another good idea that didn't pan out. 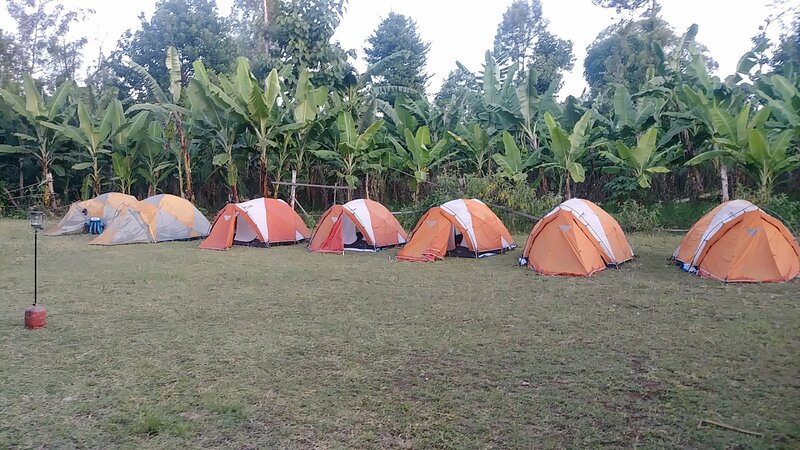 Fortunately, it led us straight to Shira 1 Camp where we'll spend the night. This second evening was absolutely the best camp of the trek. 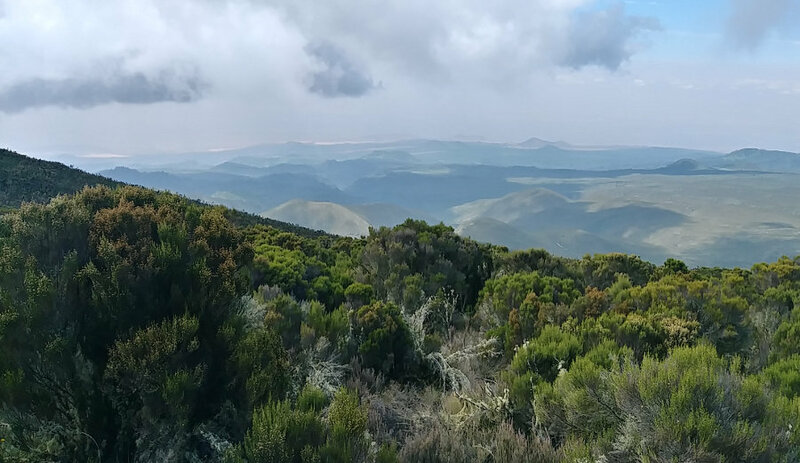 There was plenty of room and views all around, even up the slopes of Kibo. The big mountain was hiding above its blanket of clouds as it did every day from late morning until evening. As we waited patiently, the clouds gradually evaporated allowing glimpses of the peak before nightfall. It looked almost close enough to start climbing, but we'll not get that chance for four more days. In this view of camp, you can see a portable toilet in the foreground and our large 'Thunder Dome' dinner tent dead center, behind which is the bright green kitchen tent. When we hike into camp, all of this is already set up every day! All we need to do is find tent #9, lay out our sleeping bags, change into camp shoes, and relax. Relaxing includes receiving a bowl of hot water to wash with, and then making coffee, tea, or cocoa in the Thunder Dome. It's a rough life! And, it's a strange feeling having others wait on me out here in the wild where I'm used to doing everything myself - I'm afraid I may get spoiled. As you can see, my hiking attire on this trek isn't my usual drab, blend-in style. Since we're a big group, and there are multiple groups trekking, I figured something a little more vibrant might be interesting. It's totally not 'LNT', but there's no way to make a group of 100 people LNT, so I'm making it fun. I did notice on this and subsequent days that I tend to be more comfortable wearing a lot less than most others. The cooler temperatures felt nice to me while others put on gloves and fleece. We hiked from 9200ft up to 11500ft over a distance of about 5 miles. Somewhere out on the Shira Plains, we took a short snack break by this boulder - so I scrambled up and pointed the way to the summit! :-) Notice my attention-seeking shirt? I didn't want to get lost out here in the wilds of Africa! 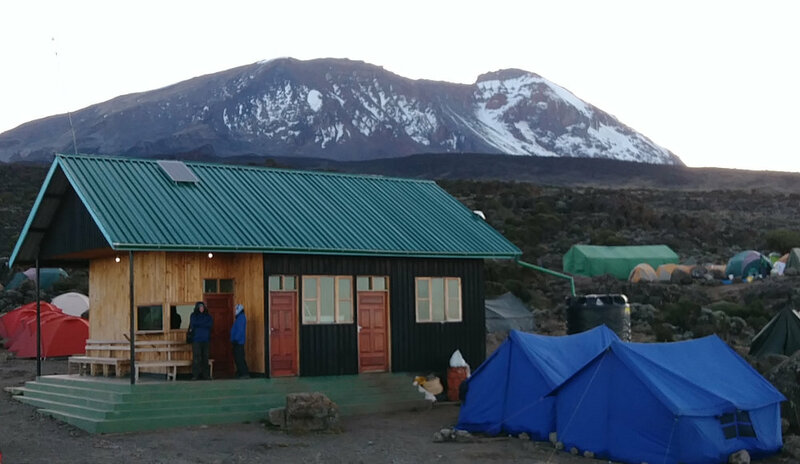 From a crystal clear sunrise behind Kilimanjaro to the last rays of light bathing the summit, we had beautiful blue skies with the mountain showing off its crown of ice and snow. This was a wonderful day of walking with no hurry and plenty to see. After yesterday being the hardest hike, today was the nicest hike of the entire trek. I woke before the sun today after a wonderful, warm night of sleep. Kili rose in the northeast with a bright star directly above it, but I couldn't get a good photo. So, I waited and watched in my down jacket and warm cap as the sun ever so slowly brightened the eastern sky behind the mountain. It was a peaceful half hour all to myself until the rest of the camp woke to the new day. We've been given something of a schedule now. The support crew wakes and gets busy at 5am, starting on breakfast, making coffee and hot water for tea or cocoa. At around 6am or so, a couple guys come to each tent with a pot of hot, real coffee for whoever wants it. Since I don't drink coffee, I've spent this time out alone looking over the land, but others in our group love the wake up ritual. At about 6:45, we get hot water for washing, then breakfast is served around 7 or 7:15. Again, all we have to do is show up and eat - tough job! These guys making breakfast are the same ones that were up well after dark cleaning dinner dishes after making us a full meal the night before. We're ready to start the day's hike once the sun warms us up. From down jacket to Hawaiian shirt by 8:30am, and it's time to start walking. Today, we gain 1300 feet, but it's a long, gradual gain throughout the day with a bit of a climb at the end. Giving way to passing porters throughout the morning, our gang snaked its way across the plains. Nearly all brush has given way to grasses and occasional bushes. Distance is more difficult to measure and the miles slide past our feet. The highlight of the day is a sidetrip to Cathedral Point which you can see on the map track of our trip. Reaching the far southeast edge of the Shira Plateau, a rocky ridge rose before us, but the main mountain was to our northeast. This ridge was actually part of the rim of the huge caldera we spent the past day hiking through. Of course, we had to climb up it to see what was on the other side. Actually, our guide told us to climb and we're good rule followers! Scrambling up a couple hundred feet, we reached Cathedral Point with a sweeping view over the plateau back to our camp from this morning. On the other side of the ridge, the mountain fell away more than a thousand feet to jungle forest like we had left two days earlier. If King Kong had made an appearance, it would have fit perfectly. 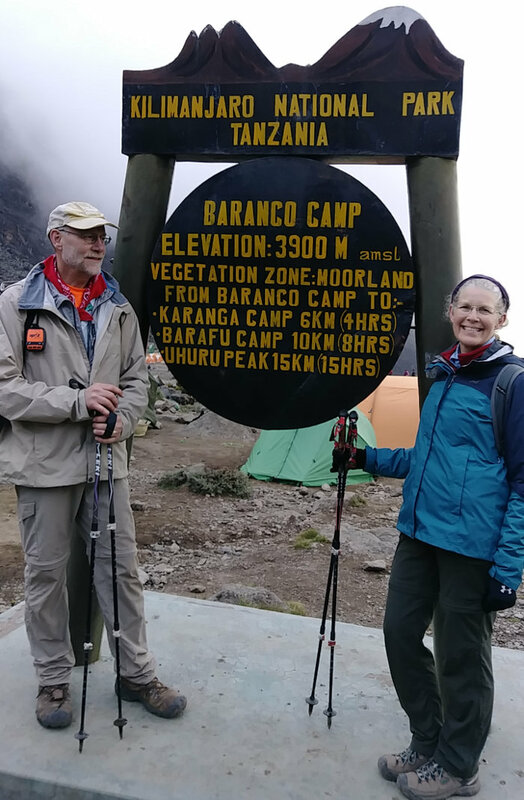 Misty clouds swept over the ridge, sometimes enveloping us, and then dissipating so we could see far below while we had a snack of hard-boiled eggs, mango juice, sweet rolls, and chapati (like a small tortilla). Cathedral Point added distance to our hike, but it was one of the most interesting spots on our trek - definitely worth the extra time and effort to visit. Really, the day's hike before it was quite easy so a bit of rock scrambling was fun. From Cathedral Point, we could see our destination for the day, but it was still a couple hours away, up the hillside. The trail took us past the end of the Shira evacuation route which was the end of the dirt road used in emergencies and included a helipad marked in rocks. In this area, we also passed through a large rock-stacking scene. 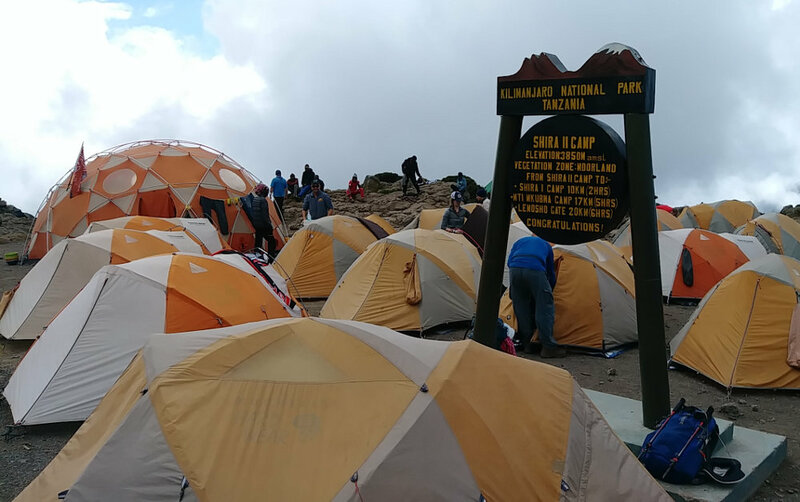 I had read that Kilimanjaro is a trash heap from the thousands of visitors, so I was expecting a mess. So far, there had been little trash, some graffiti scratched on rocks, and just a highly impacted pathway. It was much better than I had hoped for. This was the first 'Hey, Look At Me' place we'd encountered, and my Leave No Trace hackles raised a little. Rock cairns are useful when placed to mark a trail, but some people enjoy stacking rocks for no reason except to to leave their mark. Some folks like seeing these piles, but they emphatically declare 'Kilroy Was Here' to anyone passing by and detract from the natural experience. Humans have this impulse to mark territory, and some just can't hold it in check. These stacked rocks appeared quite often along our trek up the rest of the mountain, not as markers but just scattered about around rest areas. I expect it may be due to hikers being bored with long rest breaks at these spots. 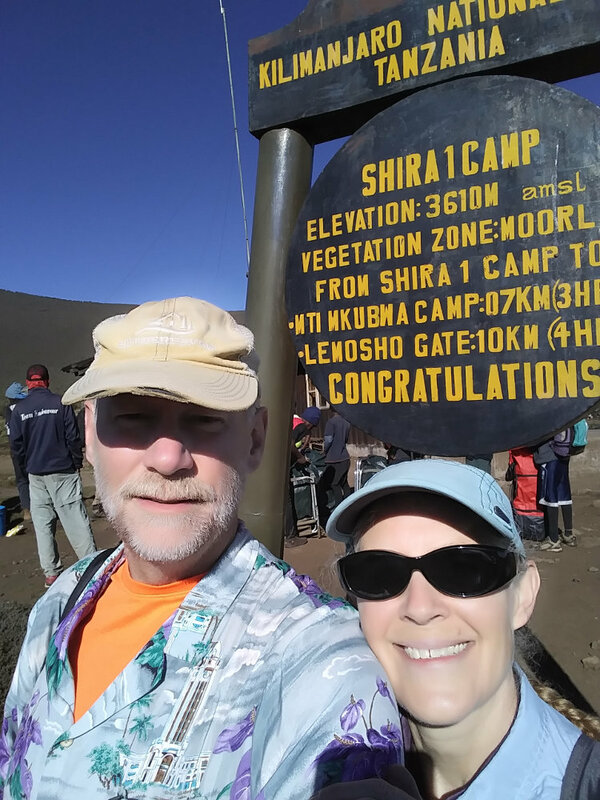 The last mile or so today was a steady climb to Shira II Camp actually on the shoulder of Mt. Kilimanjaro. There was less space here, but we still had comfortable, flat tent spots. As it turns out, one of the porters has a special job each day. He leaves early in the morning to run ahead to our next camp and stake out our territory, hopefully arriving before runners from other trek groups arrive. It seemed our runner was very good because all our sites were very good, as far as I could tell. Now that we are higher up, the views are becoming far ranging. Besides having Kilimanjaro looming above our back, we can see across the plains far below and off to Mt. Meru to the west. With clouds staying away all day, we had a beautiful sunset almost directly behind Mt. Meru - and then the temperature dropped. Being up so high with thin, dry air, as soon as the sun set the chill set in. It was a brisk, fresh cold though, making for a great night's sleep. We hiked from 11500ft up to 12800ft over a distance of about 6.25 miles.